Boat: Ericson 38, 1980 Hull#3 "Rettsie"
My water heater was never connected to the cooling system when I bought my boat. I have the low line Perkins 4-108, with heat exhcanger on the rear of the block, exhasust manifold on port side, and coolant tank in front of the block. I can't seem to find a good spot to take off for the water heater feed & return. Anyone know the best loaction? Diagram whould be great. I also have an oil cooler on the starboard side, however the raw water is not led to the cooler. Reading the Perkins Manual, they suggest this is not required for non-commersial applications, with slow RPM, and occasional use. It is a sailboat after all. Hope to here frm you guys. Thanks, Kevin Padden. PS, I run a 16x16 Martec 2 blade folding prop with no overheating problems. My excact setup as well including the oil-cooler on the Starboard side. I read somewhere (and mine is intstalled) so that the coolant tank is taken off the engine and the hot water hoses are connected in place of where that forward tank would be. 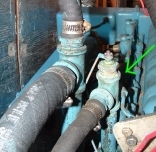 Does your heat exchanger have a "radiator style" cap on it for filling coolant? Hope the picture comes through. It looks like the hot water source is the temperature sensor fitting just behind the thermostat. The return is on the left. Don Radcliffe is right... that's the spot where the forward coolant reservoir is on boats that have it installed. It is removed and the hot water heater takeoff is plumbed right from there... as I may have cryptically said in my post too. I'm about to plumb my 4-108 for the water heater also. When I bought the boat some 18 years ago, the heater was plumbed incorrectly, and it constantly was a source of air lock and overheating. So, I just closed the fittings and went without...i.e., with only 115VAC heating. Now, a friend who is a VERY experienced marine engineer and who lives aboard and who also has a 4-108 has explained how to do it properly. The takeoff point is from the head, just behind the radiator tank. You use a 6" or so pipe with a T on top (pretty much as shown in the pic). On one side of the T you fit the temperature sensor. On the other side, you take off the hot water. The return is to the side of the manifold. His has worked flawlessly for many years, even though his tank is located some 18-24" higher than his engine. No problems. Thanks to him, I now have all the parts and will give it a go first chance I get. Good luck with yours. Let us know how it goes. Can ya send me pics and stuff, I am about ready to put in that water heater myself. Are you guys saying to remove my coolant tank? Mine is the type with an auto type twist off radiator cap. I assumed this is required like a radiator, but maybe not? I am reluctant to remove the tank, even though I know the water heater will supply a large resovoir, however my water heater tank is below the maniold and heat exchanger. I have located two 1/2" ports on the manifold, One on port & one on starboard of the manifold. Because of the install angle of my engine, the port (outside port) is behind & below the starboard (inside, right between the #2, & #3 injectors. I was thinking of trying to use those 2 ports & see what happens. PS, I know this is a late response, but I've been sailing! I've got a Perkins 4-108 also and have it plumbed to my water heater which sits under the seat 12' away next to my forward bulkhead. Everything was working fine for me, no over heating issues, until I drained all the water from my 50-100 gal fresh water holding tank so nothing would freeze and break during the winter. After draining the water from my system, which also drained the water heater, I noticed my engine overheated and watched all the engine cooling water shoot out the heat exchanger head radiator drip hose until I had no more water in my system and saw tons of steam coming out the the exhaust pipe. This scared the hell out of me and after searching the internet for possible causes and sollutions, I remembered that I had drained all the water from the holding tank and maybe that had something to do with it. Rather than fill my water tank back up with water (as winter is just beginning around here) I simply disconnected the hoses going to the water heater and returned my motor to it's original cooling hose setup. I've included some pictures taken before I disconnected the water heater hoses. You can see the heater return one laying down on the port side going to the back of the engine and the other (heater supply) going up to the thermostat. Luckily I found on the boat a new water hose the perfect length to fit from the thermostat down to the return engine hose on port side where it was connected to the heater return line which goes around to the back bottom of the block. Now, I'm trying to figure out how I can shut off that water heater when I want to drain my water system without causing problems in the engine cooling department. I think I could just install two two-way valves along the hose and attach the two hot-water heater hoses to these two-way valves. That way I can close off both of them when I want to drain the water tanks without effecting the engine cooling system. Anyway, I hope this helps, and if anybody has any suggestions on my set up, I'd like to hear them. On closer inspection, I realize it was not the thermostat that the hose is hooked to, but it is the hot water out-flow tube on top of the head, next to the thermostat. it got dark that night. . . I think what is causing a lot of confusion is that just about every 4-108 seems different from another. The ones in the pictures above are models that have a combo reservoir/heatexchanger on the port side. rom what i understand from TAD that is a later - and preferred - configuration. The original poster and I have the older design with reservoir above the thermostat, and heat exchanger behind the engine. From my explorations of my engine and understanding of what the PO did with it (had a hot water tap & return that I disconnected) I think I have a couple bits of useful info. There are two places on the top of the block where coolant can be accessed. Above pix show the aft tap location. On this boat it is used as a tap to feed hot coolant to the HWH. The temp sensor was placed at the top of the Tee - not a good location! Here is the front tap location, right behind the reservoir/thermostat. On this engine a temperature sensor is in the socket. The return of the coolant after going through the HWH is to a low side of a Y leading to the oil cooler. The top of the Y is fed directly from the heat exchanger just a few inches away. So, it looks like you are taking the coolant outflow from the exhaust manifold and routing it (all) to the HWH, then on to the HE?